Note: That one guy with the red name, yeah, he became a victim of my “renaming German townies’-spree you read about last chapter. She has the highest friendship scores with Don Lothario, Nancy Landgraab and Laura Stevens (the sad doctor Sandra cheered up last chapter). 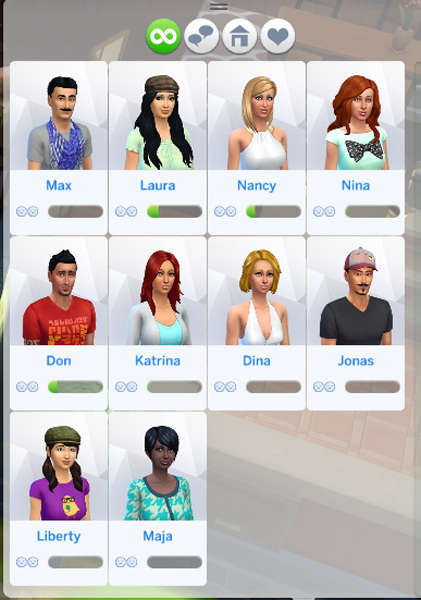 Wow, I never would have thought that Sandra’s first friends would be Don and Nancy. She’s nothing like them! But I guess opposites attract? Sandra hasn’t learned any of Laura’s traits yet so we’ll have to wait to see what kind of gal she is. It was too early in the morning to call anyone over, so Sandra decided to try out the pool. I think she loves it! (Her bathing suit is also really cool, you’ll see it later). While Sandra was swimming, I lurked around and checked if there were any cool sims in the neighbourhood. Gasp! The astronaut is back! This time I didn’t miss it and I directly sent Sandra to introduce herself. Yay! Why would you talk about painting to a fellow astronaut? 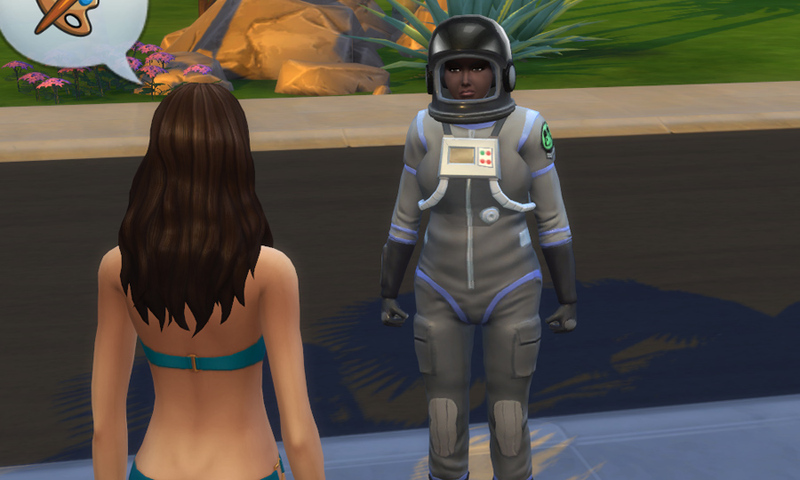 Sadly, the astronaut (I forgot her name) was very tense and the conversation didn’t flow well. I guess Sandra was so excited that she talked about completely random stuff and confused her. Bummer. I got the notice that Sandra had to leave for work soon. Nooo, I forgot to let her play chess – again! I must really remember this next time. At least I was pleased to see that Sandra’s workplace lets them have a food brake so she didn’t come home hungry. How nice! 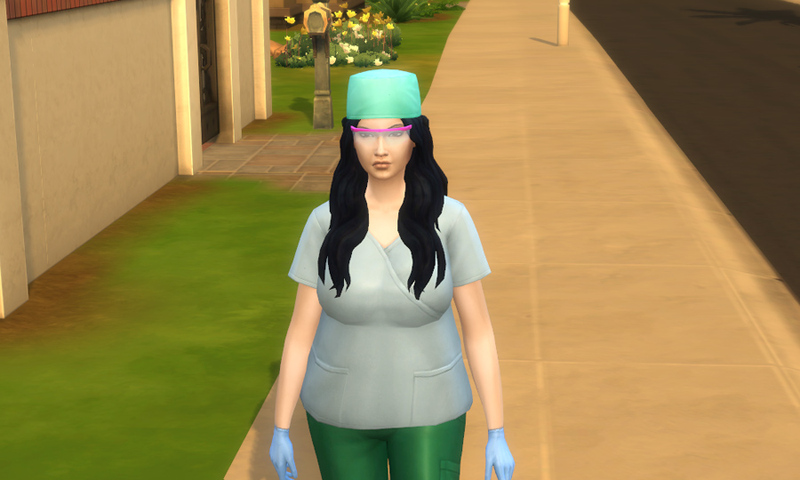 After work, Sandra introduced herself to lots of sims that were around (for her aspiration goal you know). French-mustache-scarf-guy over there was really mean to the two women so the woman in black and blue talked to Sandra about speaking up against plum people. Mustache-guy got offended and left. Well, Sandra only needed the introduction anyway. I love the brown haired woman’s outfit. It doesn’t really fit together but it suits her with her untidy hairstyle and her pink glasses. She’s probably a free spirit. I forgot her name though (so sue me!). 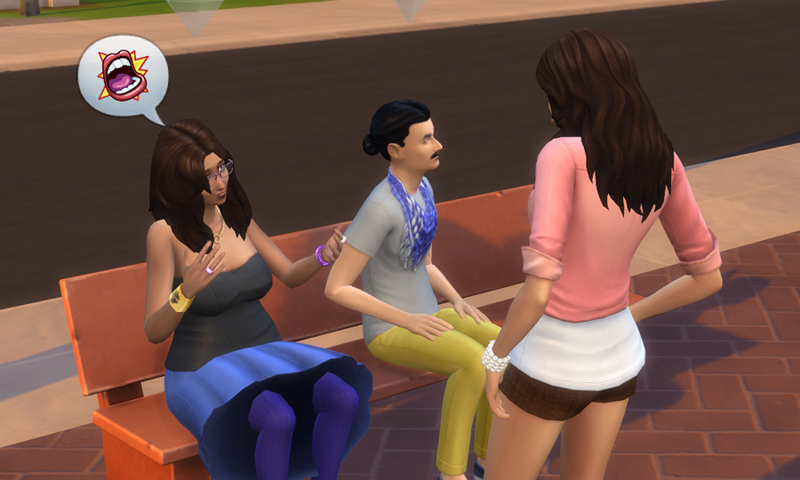 Oh and by introducing herself to free-spirit lady she also completed her aspiration task of meeting 10 new sims. Way to go, Sandra! Sandra had a whim to watch comedy again. Since she wasn’t really happy about the program last time I was inclined to ignore the whim but I decided to give it a try. It went a bit better than last time, she laughed at least once or twice. Mostly she only nodded in approval and sometimes she got so excited and held her breath and then – shrugged because apparently the build up was good but the punch line was lame. Oh, well. Do you think you can do better Sandra? When she woke up the next morning the first thing she did was troll teh forums, still in her pyjamas. At least it wasn’t Bicblock again. You’re weird, Sandra, but I still love you. This time, FINALLY, I remembered to let her play chess! And she she came home with a promotion! She is now module cleaner. The promotion didn’t give her a lot only a small bonus. But hey, working up! Laura Stevens, the doctor, walked by and she was also very tense. What going on with tense sims in this neighbourhood? Is this becoming a trend? I hope not! Sandra and Laura had a quick chat and Sandra learned that Laura is actually a doctor at the local hospital. She must work a lot because I only ever see her in her working clothes. Maybe that’s the reason why she is so tense. Sandra also found out that Laura is materialistic! Oh dear. Sandra’s only friends so far seem to be an ambitious snob, a non-committal serial romantic and a materialistic doctor. Wording it like that, it sounds really harsh. But they all get along well with Sandra so I’ll go with it. I believe Sandra just doesn’t judge them. She’s such a nice sim! I hope Laura is not befriending Sandra just because she has a fancy house. On the other hand, they only met on the street so far, so Laura doesn’t even now that Sandra has an expensive house! I think their friendship is going to be genuine (they are not friends yet but there friendship bar is filling). That’s it for today! See you next time when Sandra invites over Nancy Landgraab to make her first friend! Enjoyed chapter three and I guess we’ll have to sue each other as I forget the local names, too if I don’t write them down somewhere while playing. Maybe Sandra should host a stress-free party to help everyone she’s met unwind and relax. Look forward to reading the next chapter, next time. Great update! I like the doctor…I feel like she could have a lot offer. Yay!